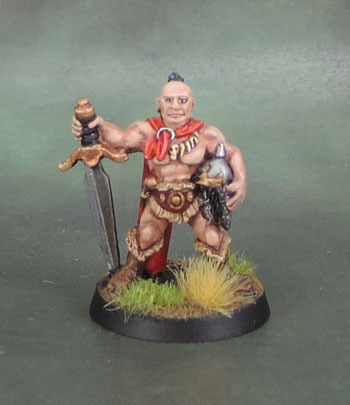 Citadel F3 Barbarians (Alan & Michael Perry, 1987) | Azazel's Bitz Box. Ok, so only our friend here with the double-bladed axe “Gerloc” actually appears in the 1987 Citadel Journal under the F3 banner, but the other two models are both variants on “Gudrud”, who is on that same page, so I’m comfortable with placing these in the same vintage. 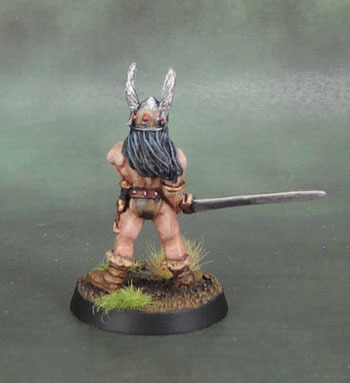 A further variant appears in the 1988 “Blue” catalogue under the Barbarian range, along with a Valkyrie-styled figure who I kept in a baggie alongside the boys here for many years. She’ll be painted alongside the Shieldmaidens and Valkyries from Foundry. 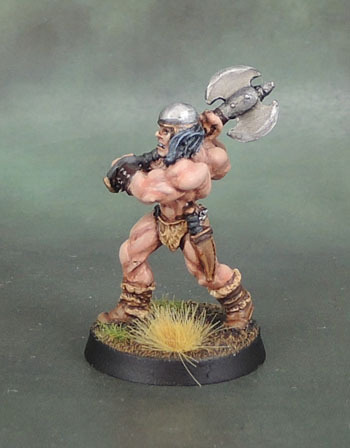 This first figure clearly draws heavy inspiration from Frank Frazetta and Boris Vallejo’s Conan artwork, as do so many barbarians from so many ranges. This figure was a real motivator for me to learn new techniques for painting black hair, which (let’s face it) can be a right pain in the arse, since we don’t want it to look blue, or grey, or dark brown. Hopefully I’ve managed to pull it off (thanks, Duncan!) and if I haven’t – blame Duncan! Gerloc here is pretty much also Conan. The spike from his helm was lost long ago, but at least I managed to keep the rest of him intact enough over the years. I painted these three together, and tried for a slightly more tanned look to their skin than my usual Caucasian skin without appearing too ruddy or too orange. Not that you can really tell here with no models to compare the trio to. Also on these three, I avoided painting on any tattoos, as I’d be temped to with any models that have a lot of muscular skin showing. Given that they’re old-school models that are a representation of a particular style of artwork (Frazetta, Vallejo) I left their bare skin bare of ink. 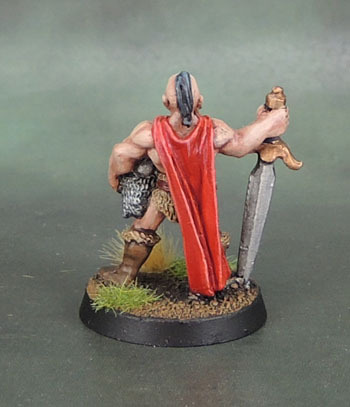 This third figure is actually not Conan! He looks and feels to me like a barbarian warlord. The stance, topknot of hair, helm under his arm and especially his cape really work together to suggest a veteran of many battles who now leads a party of warriors to battle. Of course, his stature being that of a figure circa the late 1980’s means that he looks like a peon when stood next to a newer Barbarian from pretty much any company – let alone something like a Khorne Bloodbound (his spiritual successors), so he may well be relegated to veteran warrior or even a regular warrior/cannon fodder when/if he’s used in any games. 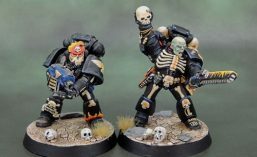 I was painting a similar Chronpia model alongside these guys, but he got bumped at the 11th hour so I could concentrate on this trio of truly old-school models. He’ll be done soon, and the four shall again be united! Finally – a note and shout-out to those people whose Blogger/Blogspot blogs that I follow – especially Curis and The Responsible One. For whatever reason, either my computer, or my browser, or something is screwy and so when trying to leave a comment in Blogspot blogs using my WordPress account often (almost always) throws me into some weird loop of selecting my username and “publishing” my comment, but then it goes back to selecting my username, and then round and round we go. So I might not be commenting much – but I’m still out here watching and reading! And if you’re unfamiliar with their blogs, you should definitely check them out! 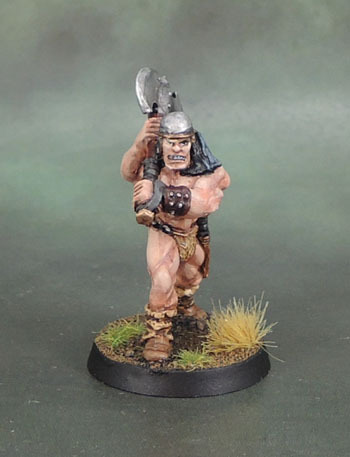 This entry was posted in Fantasy Gaming, Oldhammer, Warhammer Fantasy - 9th Age and tagged Citadel F3 Barbarians, Oldhammer, Warhammer, WHFB. Bookmark the permalink. Btw, I’ve been having the same commenting issue as you describe – specifically when using my phone through a browser. I found that switching to the WordPress App worked though – not sure if that helps you or not? Also known as Conan, Conan with a Cape, and Axe Conan. Awesome painting as always! I concur with Alex – I’ve also been having an issue with following people where sometimes it goes a bit weird when trying to follow non-Wordpress specific blogs. Hopefully it’s just a slight issue and everything will be fixed again soon! The wordpress/Blogspot issue’s been happening for awhile now, but it worked alright awhile ago. OoO is that the board game with minis? I mostly do my Word-pressing on my desktop, I only occasionally use my phone. Can you view Blogspot posts via the WordPress App? You did well with the black hair mate. All three look really cool but my favourite is the warlord. Thanks mate – I’ve always felt that he’s a really cool figure. Great stuff. 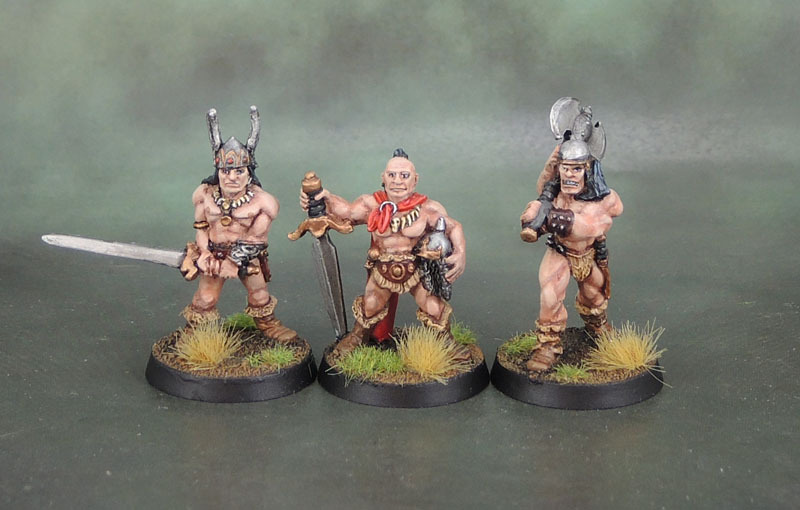 I’ve been feeling an increasing urge over the last 12 months to paint some Conan/Frazetta barbarians and I might have to give in at some point. I feel they could be quite good Chaos Marauders in a Warhammer 5th ed army. The black hair looks very well done too. Thanks Warburton. Did you pick up the Kickstarter game? There’s some great sculpts in there – and yeah, they’d make very good Marauders or even Thugs going back further. 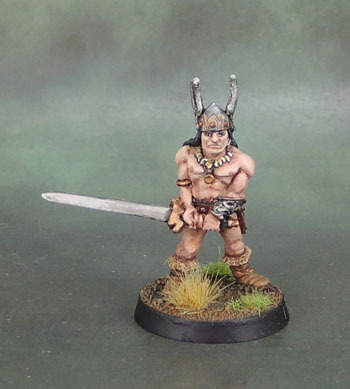 No… might have to–though I do have a lot of other random barbarian figures from various ranges…. Nice job on the black hair- and the red cape really pops. Great work on these. Thanks! I wanted the red to pop from the rich but much more muted flesh/browns/etc that make up much of the rest of them.